1 Chancel, nave, N and S aisles, W tower and S porch. Apart from the S doorway nothing remains of the 12th century church. Rebuilt in the early 13th century and again in the 14th century, the tower being rebuilt or added in the 15th century. Considerably restored: the N wall of the nave rebuilt 1630, slightly N of its original line and re-using old material; the E gable rebuilt 1624; clearstorey rebuilt and nave re-roofed in the 19th century. In 1909 the present stone porch replaced a timber-framed one, and about the same time the chancel S wall, N and S windows and S door were rebuilt. In the N aisle an altar tomb to Thomas de Wolvey (d c1305) and Alice (Clinton) his wife, also a table tomb to Thomas Astley, d1603, and his wife. 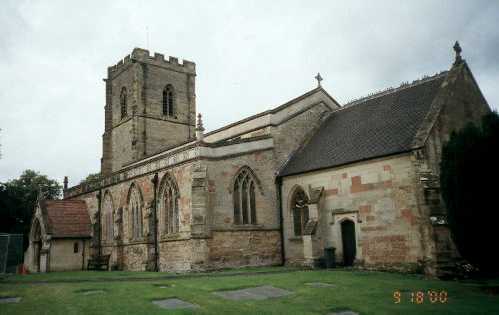 There was a church at Wolvey in 1086. 3 Drawing of the exterior, c. 1820. 4 Chancel is all Victorian, but above the E window the date 1624. Early 14th century font bowl. 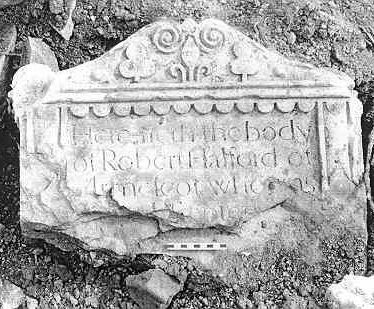 7 Archaeological evaluation on the site of the proposed church hall, to the south of the church, revealed a considerable number of intercutting, undated grave cuts. At least one of these contained Medieval pottery dating to the 12th century or 13th century which may have come from an earlier feature(s) cut by the grave. No in situ burials were found above 0.9m below the existing ground level. 8 A further trial trench to the west of those in source 7 revealed the same sequence of deposits. The whole area had been disturbed by graves, with in situ skeletal remains occurring at a depth of c0.8-0.95m. As before, residual fragments of 12th century or 13th century pottery were found, along with a single fragment of Roman roof tile. 9 A watching brief carried out for the insertion of service associated with the church hall identified no archaeological finds or features, although disturbance was generally above the level of remains previously encountered. Findspot - Prehistoric Flints from Wolvey. The site of three enclosures of unknown date. They are visible as cropmarks on aerial photographs. The site lies 300m west of Ash-pole Spinney. 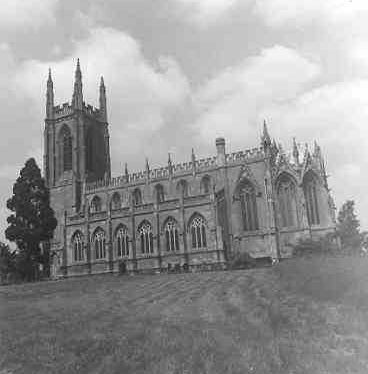 All Saints Church stood in Lower Itchington during the Medieval period. In the Post Medieval period a manor house was built on this site. Recent work identified remains of the church within the present farmhouse. 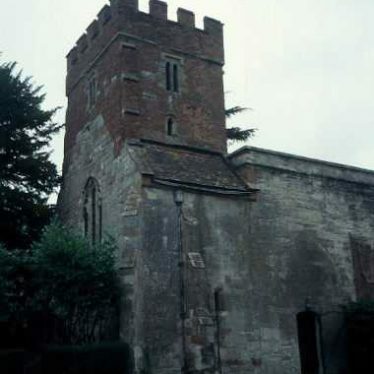 It is located 1.1km south of Bishop's Itchington. The possible site of an Anglo-Saxon cemetery dating to the Migration period. Four burials and grave goods, including a sword and a brooch, have been found at the site. It is located 1km north east of Churchover. Various finds from this area, including brooches and pottery, suggest that this might be the site of an Anglo Saxon cemetery dating to the Migration or Early Medieval periods. The site lies 500m south of Princethorpe. 19th century redevelopment at the Ropewalk, Chapel Street, Nuneaton. Features reflecting the 19th century housing developments along Dugdale Street and Chapel Street, as depicted on the 1887 OS map, were recorded at The Ropewalk, Chapel Street, Nuneaton. Several burials were found in the area of Bordon Hill, suggesting that this might be the site of a cemetery. The date of the burials is unknown. The site of an Anglo Saxon cemetery dating to the Migration or Early Medieval period. Cremation urns containing fragments of human bone were found. Finds included brooches, part of a sword blade and two spearheads. The site is located to the south of Marton. The site of a Roman settlement. The settlement may include a cemetery. A burial was found during an excavation. The boundary of the north west corner of the settlement is marked by a bank visible as an earthwork. The site is located 1km south west of Shawell.